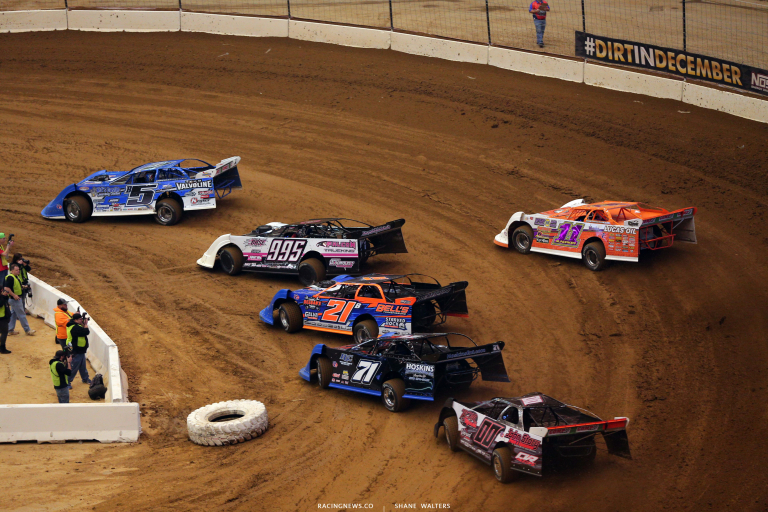 Tonight, the 2018 Gateway Dirt Nationals is set for dual feature events across all three divisions. 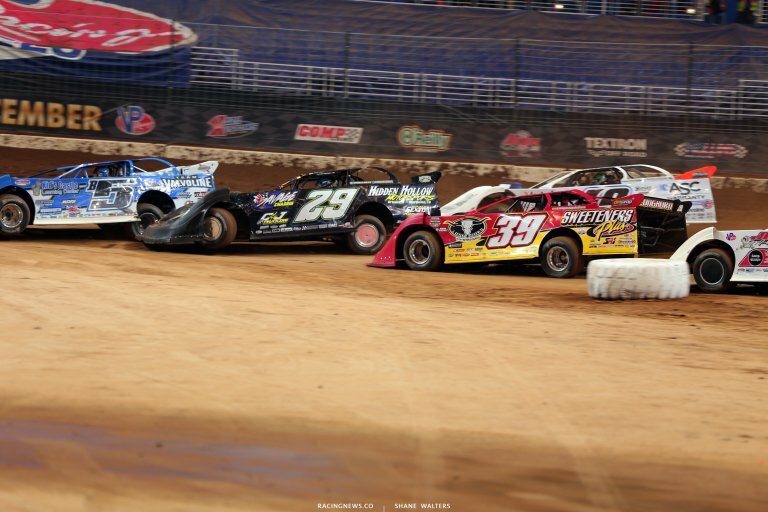 Two preliminary features in the late model division will pay $5,000 each to win. The dirt midgets and dirt modifieds will race for $3,000 in each of their mains. Tanner English and Billy Moyer Jr set the front row for the first late model heat race of the weekend. Green, false start. Green, false start. Green, English drives it hard to the bottom in turn one. He slides to the top and he’s clear off turn two. Caution, there’s a car in the wall under the flag stand. Several cars tangled in turn one. Green, caution. 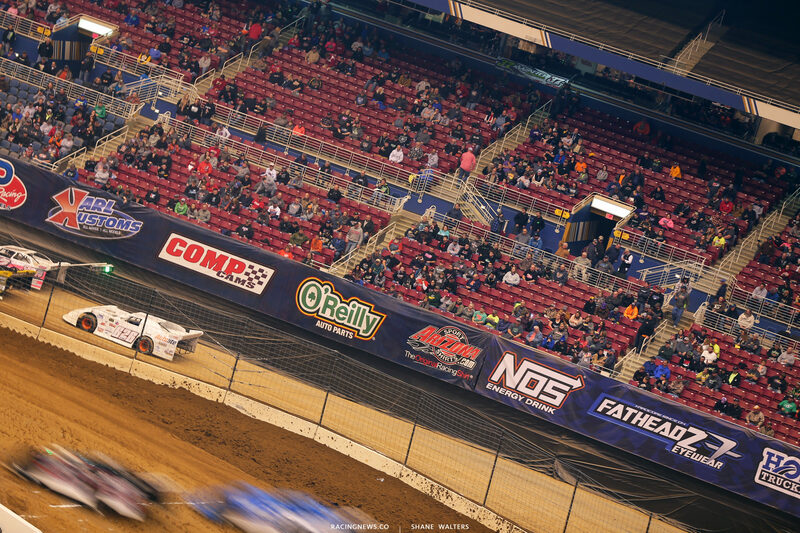 Green, Coulter pinches Moyer into turn one to take 2nd. Spin behind then, Coulter will have to do it again. Single file restart. Green, English cruises out front. He takes the win in the first heat late model heat of the weekend. Jonathan Davenport and Gordy Gundaker will lead them to the starting line in heat two. Green, Davenport wins the race to the bottom. Gundaker slots in 2nd off turn two. Lap 3, back in turn one Kiefer has stalled in the outside groove. Brandon Hood was side by side behind him. I think he was still in the gas as he plowed into the back of him. The caution is back out. Green, Gundaker bobbles on the bottom lane. Ashby runs even with him. Ashby takes the position. Kiefer has stalled again, caution. Green, Ashby is around on the bottom lane, caution. The car rotated too quick and Gundaker might have tagged his right rear slightly. Green, Ashby is around on his own, no caution. Davenport cruises to the win in heat two. Tim McCreadie and last night’s winner Rusty Schlenk set row one in heat three. Green, McCreadie is clear into turn one. McCreadie drives off to take the win. Billy Moyer and Austin Rettig line up first in heat four. Green, car around in turn one. Green, they fight for space in turn one. They’re side by side into turn three. Rettig runs wide off turn four. Moyer pulls back to is number into turn one. They’re still side by side. The rub lightly. Back in turn four, Rettig runs wide again, he lifts to avoid the wall. 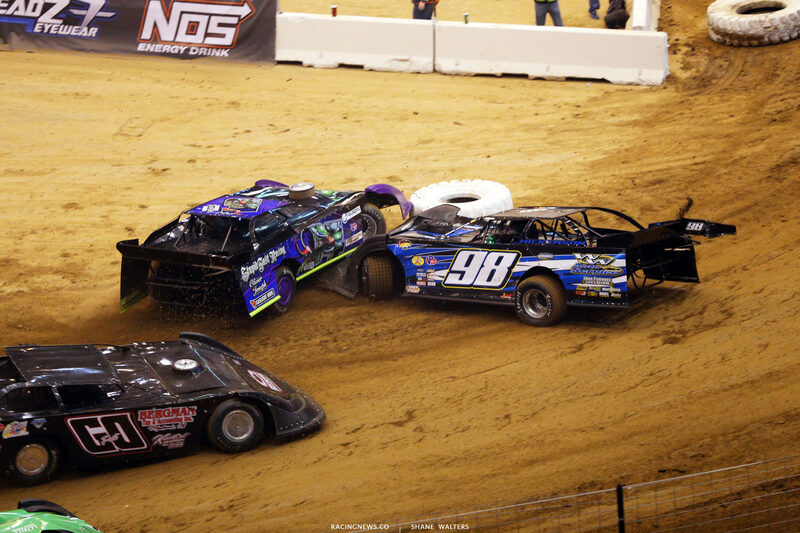 Moyer drives by on the inside into turn one. Car slow on track, caution. Green, Moyer is clear. He drives away and takes the win in heat four. Brandon Sheppard and Manny Falcon head to the track for heat five. Green, Sheppard gets the jump. Falcon drops in behind him into turn one. Sheppard drives away to win heat five. Jason Welshan and Mark Shipman set row one for heat six. Green, Welshan gets the jump. They bang doors behind him for 3rd. Lap 3, car into the tire barrier in turn one. Caution is out. Green, caution. Green, Welshan takes the win in heat six! Defending winner of the Gateway Dirt Nationals, Bobby Pierce and Caleb Ashby lead them to the flag stand. Green, Pierce leads off turn two. Cory Ford has a run on Eric Hickerson into turn one. Hickerson didn’t believe it so he turned to the bottom and stuffed them both into the tire barrier to bring out the yellow. Ford was ahead of Hickerson by a few inches into turn one. Green, caution. Green, caution. Green, caution. Green, caution. Green, Pierce drives away to take the win in heat seven. Tyler Carpenter and Shannon Babb set the front row for heat eight. Green, Babb to the lead on the outside of turn one! That’s the first car to do that all night. Green, Babb does it again and the caution is out. Complete restart number three. Green, Babb powers to the cushion and takes the lead once more. Caution, one lap complete. Green, Feger and Carpenter run side by side for 2nd. Babb drives away as he explores both lanes. Babb wins the eighth heat of the night! Zach Dohm and Daryn Klein will lead them to the starting line for heat race number nine. Green, Dohm leads. Spatola bangs doors for 2nd. Dohm drives off to win heat nine! Dennis Erb Jr and Myles Moos will lead them into turn one of heat ten. Green, Erb leads into turn one. Caution. Green, Erb has fluid leaking out of his machine. He slows as the leaders tangle. The caution is out as Erb pulls to the infield. Jeff Herzog comes from 6th to take the lead. He drives off to the win. Logan Roberson and Don O’Neal head out of the staging area for heat race eleven. Green, Roberson gets the jump. O’Neal holds 2nd. Roider is working the top. He bails and drops to the bottom but picks up a flat tire. Roberson drives off to take the win in heat eleven. Payton Looney and Chad Zobrist set the front row for the final late model heat of the night. Green, Looney leads into turn one on the bottom. He slams the tire barrier in turn one! He didn’t see it coming. Green, the leaders tangle in turn one. It’s the third complete restart. Green, Zobrist leads. Marlar is working the top. He’s the only car up there but he’s side by side for 2nd. Several spins at the back. Zobrist finally brings it home with a win in the final heat race of the night. Next up it’s the first of two prelim main events for the dirt late model division. 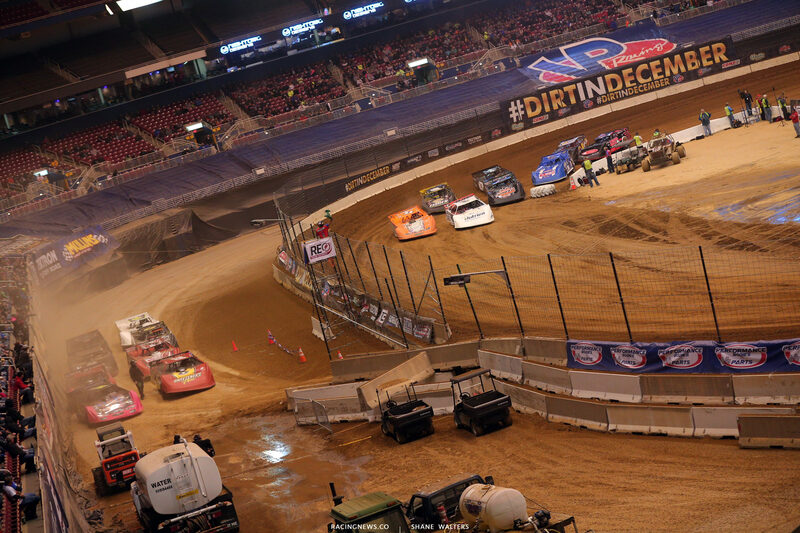 The 20 lap main event will pay $5,000 to the race winner. 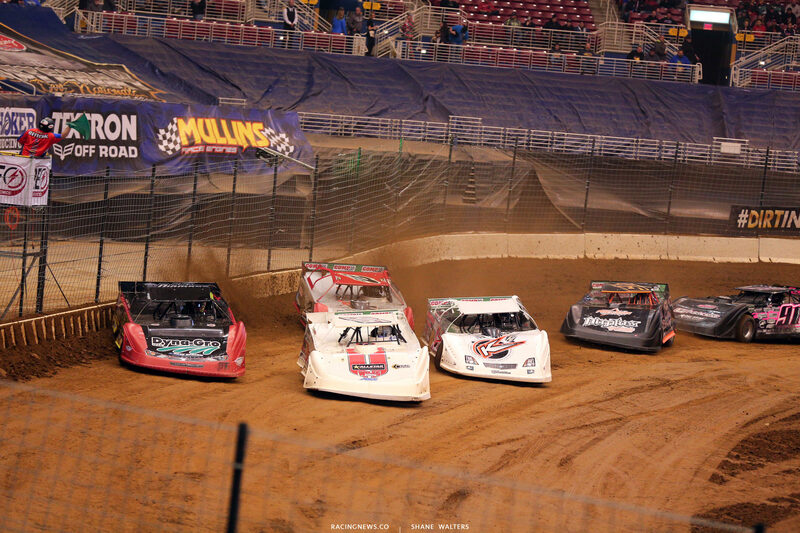 Brandon Sheppard and Jason Welshan set the front row. Green, Sheppard leads into turn one. 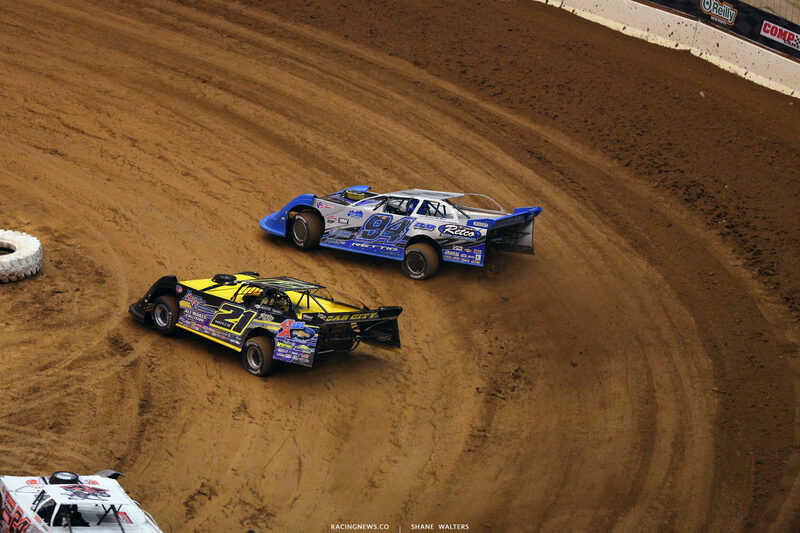 McCreadie and Davenport run side by side for 3rd. McCreadie wins that battle on the bottom. McCreadie takes 2nd. He’s closing on the leader. Sheppard splits the lap cars, three wide. 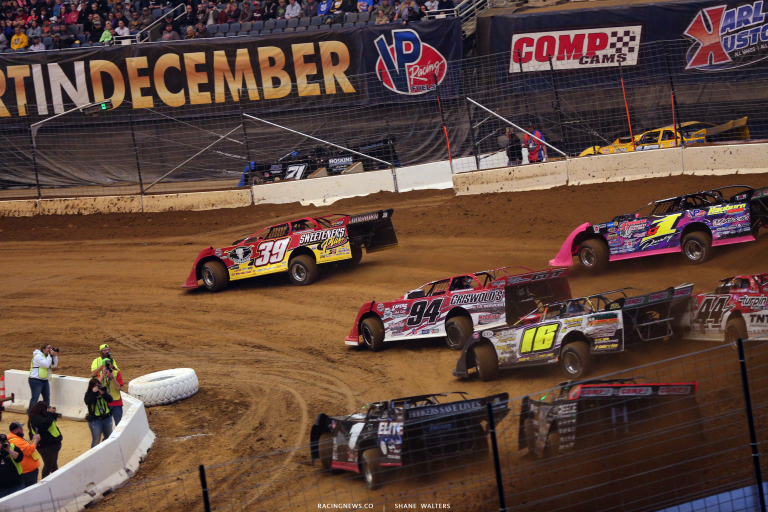 Billy Moyer Jr jumps the cushion in turn one. A few laps later, the entire nose has folded under the front wheels. Moyer is stopped in turn three and the caution is out. Green, Whelshan retakes 2nd. McCreadie moves around him again. Sheppard opens up a five car gap after they fought for 2nd. Sheppard drives away to take his first main event victory under The Dome. Zobrist and Herzog lead them to the start in the second main event of the night. Green, they run even for the lead off turn two. Pierce and Babb fight hard for 3rd. Pierce takes 2nd on the top. Babb follows him through. Zobrist bobbles. Pierce goes to the top and Babb goes to the bottom. They split Zobrist as he collects his machine. 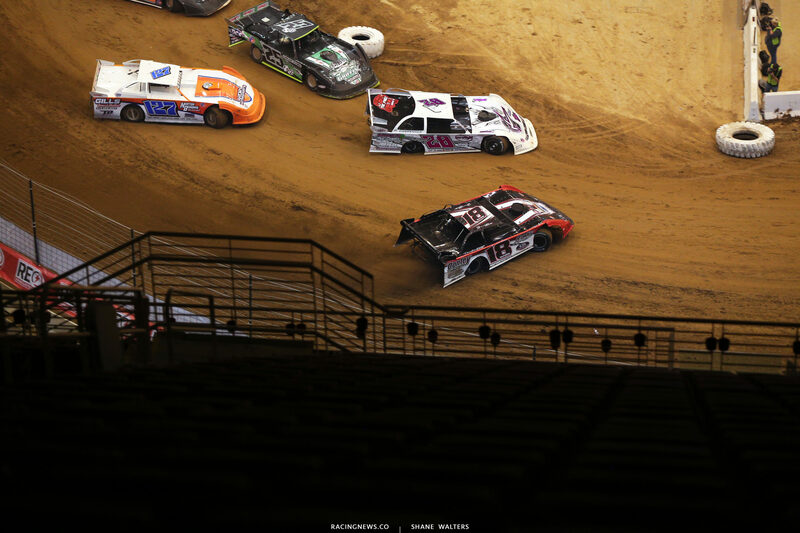 Pierce and Babb bang fenders down the back stretch. Babb drives it deep into turn three. He’s sideways and nearly spins in front of the field. He collects it. Caution. Green, Babb is in the wall in turn one. The caution is back out. Green, Don O’Neal to 2nd! Pierce holds the lead. Lap 10, car around in turn three. The caution is back out. Green, Pierce leads. Zobrist and O’Neal trade the 2nd position. 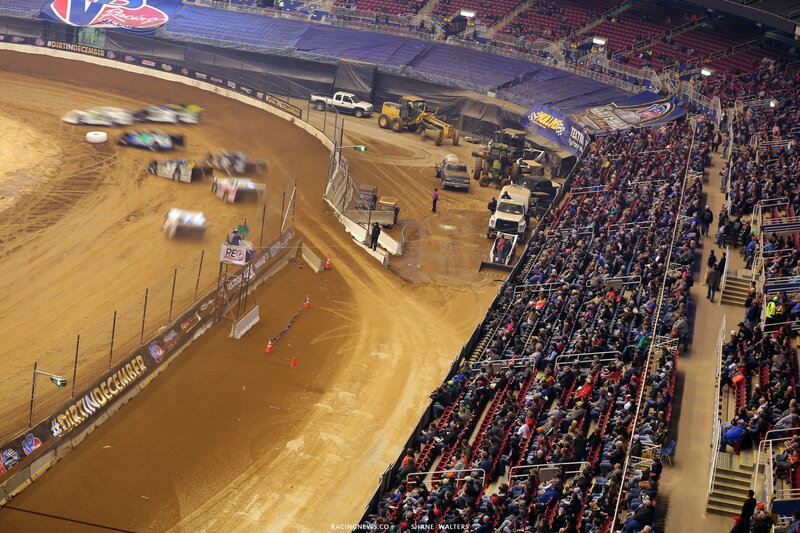 The track is rough tonight and there’s no lane around the bumps. It’s through the bumps or get off the track. 2 to go, car around. The caution is out. Green, Caleb Ashby is sideways from 4th. He was on the gas through a rut. When he landed it jumped out of his hands. That stacks up the entire inside line. Zobrist, Dohm, Manville and more are collected. The caution is back out. Green, Pierce opens up a gap. 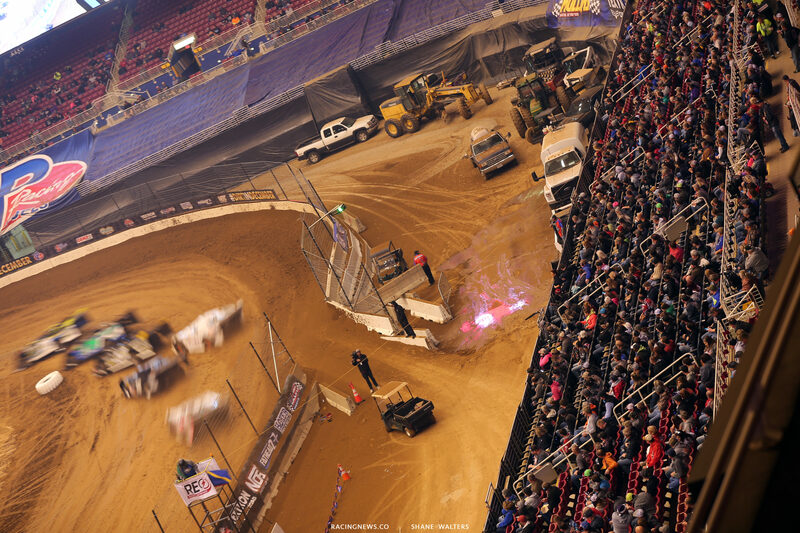 He drives away to win the final main event of the night!